Act Now to Stop H.R. 3717: Force Is Not Recovery! You are here: Home / Civil Rights & the ADA / Act Now to Stop H.R. 3717: Force Is Not Recovery! On December 12, 2013 Representative Tim Murphy (R) of the 18th District of Pennsylvania introduced H.R. 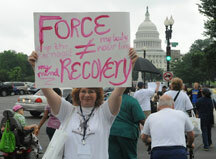 3717, the Helping Families in Mental Health Crisis Act of 2013. If passed, this bill would reverse major advances of the last 30 years in mental health services and supports. NCIL stands firmly against this bill. Please take the time to read NCIL’s legislative summary (PDF or plain text), which outlines the numerous threats to the civil liberties of Americans with disabilities contained in this legislation. Then, ask your family, friends, co-workers and other community members to do the same! For more information, or to report the response you received from your Representative, please contact Shoshanna Fawley at 602-296-0592 or sfawley@abil.org. Are you sure this Republican is trying to use force? I have a mental illness, and I read H.R. 3717 myself. I think the campaign to fight stigma sounded good, and the educational grants for the disabled interested in higher learning, etc. The idea that he wants more money put into mental health care is another good thing. Is all this about the anti-lobbying? I’m a liberal too! Hr 3717 Removes HIPAA Handcuffs and Reforms FERPA so parents can get info they need to help provide care to seriously mentally ill loved ones. HR 3717 Preserve enough psychiatric hospital beds for patients with serious mental illness who need them. Matthew, gee thanks for the extensive copy paste session…. Some who have commented don’t see the wolf in wool here- this bill would deny legal representation, violate civil rights, and undermine patient privacy….yeah, it sounds like more funding, it sounds like help, but it will only fortify coercive practices. Ive experienced hellish conditions in mental health care and have had to petition courts for my release, fighting for my rights….this bill will make that harder to do, unthinkable! So what you are saying is…We need more James Holmes’s, Adam Lanza’s and Jared Loughner’s not getting the help they need? Wow…Sorry but I do not agree.